The time has come for you to replace or get a new generator to power your RV. The market as it is swamped with different kinds of generators. It may get confusing for you since new models flood the market every day. 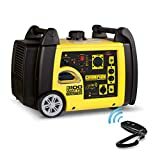 How to Choose ​the Best Portable Generator for RV? 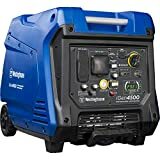 Type: This is a portable generator that is gas powered. This inverted generator relies on a single cylinder, 4-stroke engine that is able to produce energy fast. Considering that the engine is air- cooled it may overheat if overworked therefore be alert. Weight and size: It is not entirely a lightweight unit. It weighs 44.1pounds with 19.3 x 11.0 x 17.9inch dimensions. Wattage: for such a unit, it cannot effectively power a large space. This unit has a maximum wattage of 2000watts. Small RVs would appreciate these generators effort more. Fuel capacity and running time: As stipulated before, tank capacity directly affects your running time. This unit is designed to have a 1.1gallons capacity tank which is not much to run for too long. You have about 10.5 hours if you are powering small load items. Larger units will shorten its running time. Starting mechanism: The unit is fitted with an auto-compression system to allow the operator to start the unit easily. Also, the unit can warm up automatically to provide sudden energy requirements in cold conditions. Can be connected to another unit through parallel connection to optimize power output. Noise level: you will be happy with the noise level on this system. Operating at a low noise level of 51-61db. This is can run quietly enough not to agitate your neighbors or the sleeping baby while camping. Fuel gauge: To facilitate easy refills and prevent damage to the engine, the unit has a fuel gauge. The gauge is easily visible therefore the operator is aware of operation levels. Warranty: Together with a 3-year warranty, you get a unit that enables battery charging with the cables supplied. The EPA & CARB Emission Engine Durability Rated product will not disappoint you. Type: This is a gas-powered portable generator. The Honda GX100 engine with 98.5cc displacement works well-powering items such as the television or the refrigerator. Wattage: The maximum output of this inverter generator is 2000watts which means it can only cater to small applications. Weight and Dimensions: Weighing in at 45.6pounds it is slightly heavier than some models. The size of the unit can be estimated as 16.7 x 11.4 x 20.1 inches. Larger RVs will have to look for a larger unit. Tank Capacity and running time: Considering that it only houses .95 gallon of gas the expected running time will be short. The approximated running time on this portable generator is 3.4 hours on a rated load and 8 hours based on a ¼ load. Your TV will run for some time if nothing else is consuming the energy. Starting systems: There are models that can be started by remote control and unfortunately it is not one of them. This unit relies on a recoil system to start the engine. In cold conditions, this may take a while. Handle: Ergonomic handle fitted to facilitate the easy movement of the unit from one location to the next. Noise level: Fortunate for all who use this unit that it does not run noisily. Operating at only 59db on the full level and 53db while on ¼ load is not so bad. It will not disturb your neighbors or the animals around you. Warranty and additional features: This unit is compatible with parallel power attachments to increase energy output. The cables for this application have to be purchased separately. This unit is supplied with a 3- year warranty. This is a sign of confidence in the product that you are purchasing. Type: A as powered portable inverter generator with a 79.7 cc 4-stroke OHV engine to provide maximum output. The air-cooled engine can run for a while due to continuous heat dispensation. Noise level: It is not a noisy unit to operate. With only 51db being produced at a ¼ load we highly doubt anyone will be disturbed by noise. Even at night, you can catch a few hours of sleep with ease. Weight and dimensions: This unit weighs an approximated 48pounds which are not too heavy compared to the larger models. To see if it would work for your needs, the dimensions of the product are 18 x 11 x 18 inches. Fuel tank capacity and running time: For 1 gallon of gas you acquire approximately 6 hours of running time. One gallon is not much but it will take you for a few hours before needing a fuel refill. Wattage: The unit runs optimum at 2000watts and that is during surge options. On regular running operations, the wattage to be expected is 1600watts. This is only enough to feed small appliances that don’t take up much energy. Handle: A large ergonomic handle has been placed centrally on the generator to balance the weight during transport. Prongs: The unit is designed to house 3 prong receptacles for use. Eco mode: The generator has a mode that allows the unit to adjust how much fuel is being consumed while in eco mode. ​Warranty: A 2-year warranty is supplied with this product. In the case of any mishaps activate your warranty to get solutions. Type: High-quality gas powered inverter generator operating with a 79cc OHV 4-stroke Westinghouse engine. This unit effectively runs to power cell phones, computers and many more. Wattage: This unit offers 2200watts as a starting wattage and 1800 watts as the running watts. That is a bit higher than what other models offer therefore it can charge large units like computers. Weight and Dimensions: For a unit that produces higher power than others it is surprisingly easy lightweight and easy to carry. The unit is ​19.7 x 11.2 x 17.9 inches and weighs 4​6.3 pounds. Handle: Handle is well made to provide a firm grip and offer balance while moving the unit. It is also centralized to help maintain balance. Tank capacity and running time: This portable generator can house up to 1.​2 gallons of gas. The expected running time when you are operating at 25% load is 1​0 hours. This is not bad if you are not running too many functions. Noise level: The generator does not produce much noise. The decibel rating on this product is 59db. Warranty: A warranty of 3 years is offered together with this product. Verse yourself with the terms and conditions to understand what is covered. Type: an Inverted generator that runs with a 111cc OHV Briggs and Stratton engine. You can plug in blenders, and TVs among other things. Wattage: For power, this unit is designed to run on 2200watts starting and 1700watts running. This unit is capable of powering small RV very well. Stacked with 120V Household Outlets, 12V-5A, DC Outlet + USB Adapter and a parallel port. Tank capacity and running time: The lightweight unit only contains 1gallon of gas. This provides you with about 8 hours if you are operating at 25% load. Fuel Gauge: The fuel gauge enables the user to clearly see the fuel that is in the tank. It will tell you when the fuel is too low that it can damage the engine. Weight and dimensions: It is not a little unit. It weighs 54.6pounds and measures 19.9 x 14.4 x 22.4 inches. You need a bit of muscle to move that around. Handle: Due to the weight of the unit, proper support is needed. This unit is designed to have an ‘H’ handle. This allows for equal weight distribution and comfort while in transit. Noise level: The unit runs considerably quietly operating at 59db at 25% load. This is quieter than most generators run for. ​This article will showcase some of the features and general information that might be of help to you. Below you will find a guide to help you understand common features found in a best portable generator for RV-inverted generator products. Different fuel sources all come with their respective advantages and disadvantages. Many models in the industry rely on these four energy sources to run efficiently. These kinds of models are very common and depending on where you are located. The good thing about this models is that they have the capabilities of extracting maximum energy. Their slight downside is in the case of carbon monoxide and other poisonous gases that may harm the user if no ventilation is available. These are definitely the healthier choice compared to the diesel-based generators. They create energy efficiently and are not too costly to run. They are not reliable enough to charge big RV but they can take care of small applications. Because they are light the wattage produced is not as high. Many people prefer it however due to the easy availability of gas. It also has a carbon monoxide threat but if used in ventilated areas it can be managed. These models do not actually use electricity to make electricity. These models only have an electric start fitted to the engine rather than a manual start. This just makes it easy to activate the unit into use whenever called for. Batteries are involved to facilitate this easy electric start of the engine. In the case of wattage, the number of things to be powered will increase the wattage needed. Let’s say you have an air conditioner inside the RV. This unit may need about 15000btu to run. To comfortably meet the energy demands of this unit you need a portable generator that produces 3000 watts. The bigger your RV and its energy requirements, the higher the wattage produced should be. The higher your tank capacity the longer the unit is able to run. Constant refueling is the challenge that you are likely to face when working with a generator with a tiny capacity tank. Large units have large tanks but they are slightly heavier. Portable generators come in different sizes and weights. The larger the tank and the engine the heavier the unit will be. That is why you will find some units fitted with wheels and handles. The wheels balance the weight of the unit while moving from place to place. the noise level is measured in decibels. The higher the decibels the louder the unit will operate. Units that operate at 85db and above can prove distractive to the environment around you. If you are noise sensitive try look for models that run on low noise levels. You can choose to buy models that have an electric start so that activating the generator is easier. There are some that can even be started with remote controls to save the operator the walking distance. ​Since they are usually left outside, it is important that the generator is protected from the elements. The outside shell should be leak free to protect the inside components. Waterproof outlets are required to ensure water and oil do not mix. There should also be earth leakage protection so as to optimize on energy produced. Finding the best portable generator for RV-inverted generator purposes is very simple. The size of the units you want to power will determine the overall wattage to expect from a portable generator. Be safe end make certain that everything is where it is supposed to be. Avoid overloading the unit just to avoid any concurrent accidents. With that said we hope you have enjoyed this article.